Are you up for a fun challenge? One that will help you showcase your organization’s mission and work? What a great opportunity to create a compelling advocacy piece for your library and to learn more about digital tools you can use to share your “story” with your community. The TechSoup Digital Storytelling Event kicks off tomorrow (Thursday January 13) with a free webinar: How To Tell Your Story. A second free webinar, Tools for Digital Storytelling, is scheduled for January 20. 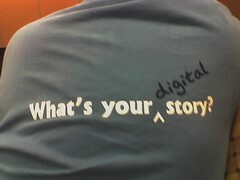 The Digital Storytelling Challenge also begins tomorrow and runs through January 31. Participants will have several weeks (January 13 – January 31) to create a 60 second video 5-panel picture story, showcasing their mission and work. No production or storytelling experience is necessary. TechSoup is here to help through free webinars tools and strategies for creating your digital story, featuring leading nonprofit, media, and communications experts, as well as an event discussion forum where you can ask any questions as you go about creating your story. The deadline to submit your entry is January 31, 2011 at 5 PM Pacific. Oh and did I mention PRIZES? I’ve just signed up for the webinars and looking forward to sharing the tips and ideas I learn with the Digital Storytelling class we’re holding at the Champlain Valley School Library System in Plattsburgh later this month.